Nowadays government is turning digital and stepping on to social media to let its citizens know about the current updates and notifications. Union ministers like Sushma Swaraj are resolving possible social issues within hours and on the other hand, there are some websites and social media pages handled by the government which is quite often trolled for their lame services. 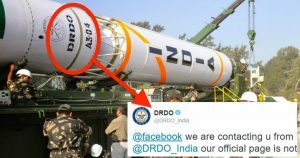 India’s top military agency, Defence Research and Development Organisation (DRDO) has joined this category by posting some frugal issues regarding ‘signing in into facebook account’. The organisation simply took on to its twitter handle and tweeted on the issue tagging ‘facebook’ directly, maybe they’re expecting Mark Zuckerberg himself to resolve the issue. This publicization of the problem resulted in a lot of criticism from others. While many questioned the competence of a research organisation for defence services, many of them provided solutions for the same- some funny and some serious. Some criticised the agency for recruiting poor social media managers, meanwhile, others took no room left in trolling the page. Quickly after getting slammed on twitter, the respective authorities quickly deleted the post.